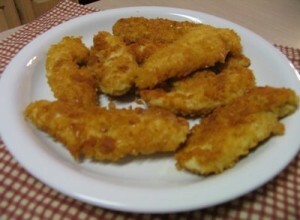 Chicken Breadcrumb Fingers recipe by Sajda.e at DesiRecipes.com. Try these garlicky, lightly breaded chicken strips just require a buttermilk marinade before a quick saute. Enjoy with your favorite dipping sauce or ketchup. You can make it a low fat appetizer by baking it instead of frying. Cut the chicken into small strips. Mix in the double cream, garlic , chopped green chili's and salt with the chicken . Set aside for about 10-15 minutes. Then take out the chicken pieces from the marinade and coat thoroughly with the breadcrumbs. Fry till chicken is cooked. Enjoy on its own or with tomatoe sauce (ketchup).